New Sub-$1000 Nikon Revealed Days After my Photo-babble-ography. Go figure. I came across an interesting bit of news this morning, while waiting for a certain lab group to let us use an experimental apparatus for class. Nikon released a new camera today, the D5100, priced as an intermediate-level camera between the D3100 and the D7000. Notable features include an articulating tilt screen like that found on the 60D and T3i, 1080p HD video recording at 30 FPS, a built in HDR mode, ISO expandable to 25,600 (“ISO 102,400 when used in night vision mode” WHOA), and a 16.2 megapixel sensor. Oh, and an microphone jack with Nikon advertising it’s own unidirectional stereo microphone attachment that clearly has a thought put in. Cable stop to kill noise transmitted up the stereo wires and a low-cut filter to remove noise from things like wind? Isolated from body vibrations from the camera? Sounds a bit classier than just plugging a spare headset microphone lying around the house. 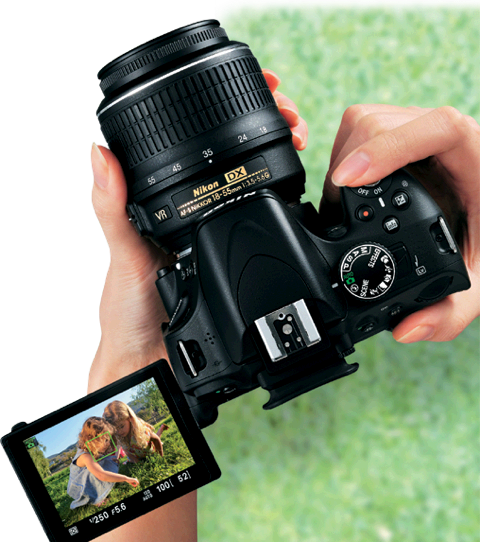 The D5100 supports continuous auto-focus during filming. Video encoding is H.264 MPEG-4. No word yet on manual modes. I haven’t seen a DxOMark review of the camera, as it hasn’t been released to the public yet, but early indications would give the D5100 an identical sensor to that found in the D7000, 16.2 Megapixels. That would be nothing short of awesome, as the D7000 has similar low light performance to that of the K-5. It would also put the D5100 in the running for best image sensor in a sub $1000 camera. The D5100 starts at $799 body, $899 kit 18-55. I would be lying if I said I wasn’t tempted.